The third largest of the African Great Lakes, Lake Malawi extends across almost a third of the landlocked country of Malawi. The lake is approximately 360 miles long and nearly 52 miles wide and is therefore romantically known by some as the Calendar Lake. Malawi is not the only country to border the lake. Mozambique and Tanzania also touch upon its shores, and in those countries, it is known as Lago Niassa and Lake Nyasa respectively. Wherever you're visiting from, the lake's clear, fresh waters and golden beaches weave their own unique spell. Although it's not certain how old the lake is, some geologists believe that the lake basin began forming as much as 8.6 million years ago. It would have provided an invaluable source of fresh water and food for those living on its shores since the time of the earliest people in Africa. The first European to discover its shores was a Portuguese trader in 1846; and 13 years later, famous explorer David Livingstone arrived. He gave the lake its Tanzanian name, Lake Nyasa, and also gave it two of its informal monikers - the Lake of Stars and the Lake of Storms. In 1914, Lake Malawi became the site of one of the first skirmishes of the First World War, when a British gunboat stationed on the lake opened fire on a German gunboat in the same area. The German gunboat was disabled, causing the British to hail the event as the first naval victory of the war. Today, the lake is perhaps most famous for its incredible biodiversity. Lake Malawi National Park was set up to preserve the lake's colorful cichlid fish, of which there are many hundreds of different species, nearly all of them endemic. These heavily adapted fish are an important key to our modern understanding of evolution. The southern shore is the most visited area of Lake Malawi because it is the most easily accessible from Lilongwe and Blantyre. The beautiful beach at Senga Bay, for example, is under 2 hours' drive from the capital, while the Mangochi area of the lake is best accessed via Blantyre. The latter is home to some of the lake's larger lodges and is known for its idyllic beaches and calm waters. 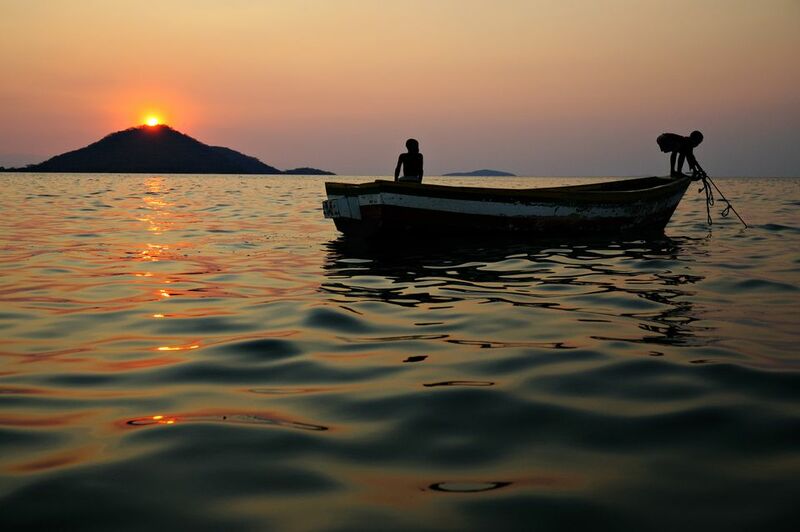 The most famous destination on Lake Malawi's southern shore, however, is Cape Maclear. Perched near the tip of the Nankumba Peninsula, Cape Maclear is beloved for its white sand shores, crystalline waters, and fascinating offshore islands. Lake Malawi's central and northern shores are much less developed, and therefore make a rewarding getaway for those willing to travel longer distances. Much of the action in this area revolves around the fishing town of Nkhata Bay, whose own Chikale Beach is known for its clear waters and abundant fish life. There are several lodges to choose from here. Just south of Nkhata Bay lie the picture-perfect enclaves of Kande Beach and Chintheche; while Nkhotakota is a great choice for nature lovers. Combine your stay with a visit to the Nkhotakota Wildlife Reserve, home to a population of translocated elephants and an estimated 280 bird species. Located in the central eastern part of the lake, Likoma Island belongs to Malawi but falls within Mozambican territorial waters. It's home to a huge cathedral built in the early 1900s, and with just a few cars, is renowned as one of the most peaceful destinations on the lake. There are several blissful beaches upon which to soak up the sunshine, while kayaking trips and walks inland are great additions to any Likoma adventure. Accommodation varies from laid-back backpackers to five-star luxury lodges. Getting to Likoma Island is half the fun. Book a scheduled flight from Lilongwe or make the trip on the legendary MV Ilala. Lake Malawi is a paradise for those who enjoy water-based activities including sailing, swimming, windsurfing, and water-skiing. Most lodges and hotels offer fishing trips, while those that prefer to be under the water rather than on it can indulge in some truly unique snorkeling and scuba diving. The waters are mostly calm and crystal clear, making this the ideal place to get scuba certified. Kayaking is especially rewarding around Mumbo Island (near Cape Maclear), and every year, the lake hosts a three-day music extravaganza known as the Lake of Stars Festival. At the end of a busy day, sample the local cuisine whilst admiring the spectacular sunset, Malawian beer in hand. Lake Malawi has been a favored destination for backpackers for many years, a fact reflected by its impressive choice of budget accommodation. On Likoma Island, Mango Drift Lodge offers a range of affordable beach chalets, dormitories, and campsites and has its own beach bar and restaurant. Kande Beach is a great choice on the central west coast, with options for camping and self-catering. Those heading to Cape Maclear should check out the Gecko Lounge, a popular backpacker retreat complete with a bar, a restaurant and a range of water-based activities. At the other end of the spectrum, Likoma Island's Kaya Mawa lodge is a beacon of luxury, with eco-friendly cottages decorated in sophisticated rustic style. Some have private plunge pools, and all guests benefit from the on-site spa, bar, and restaurant. Pumulani is a similarly decadent choice near Cape Maclear with an infinity pool and 10 individually designed villas; while Makuzi Beach Lodge in Chintheche is a lovely retreat on the central western shore renowned for its gourmet cuisine and perfect lakefront views. If you're headed for the southern shore, you can take a local bus to Mangochi or Monkey Bay, and from there arrange a pick-up with your lodge or hotel. You may also be able to travel onwards by local taxi. Likoma Island is accessed via plane or via the MV Ilala, a Lake Malawi institution moored in Monkey Bay that also provides ferry services to other destinations around the lake shore. If you intend on traveling by road to the northern shore, take a local bus to Mzuzu, Karonga or Nkhata Bay. Renting a car is another option, as the roads are usually relatively well maintained.